JUNE 2009 – Movmnt presents the first ever environmentally friendly magazine in the shape of a giant poster. This issue is a statement and need to artistically reinvent ourselves in these times of environmental consciousnesses and economic crisis. This Spring, Movmnt creatively brings a giant issue in the form of a fold-out poster that includes content you would normally find while flipping pages in a regular ‘ol magazine. This one-of-a-kind issue uses less paper and is printed on recycled paper as always, just another way Movmnt is stepping up to help save the environment. 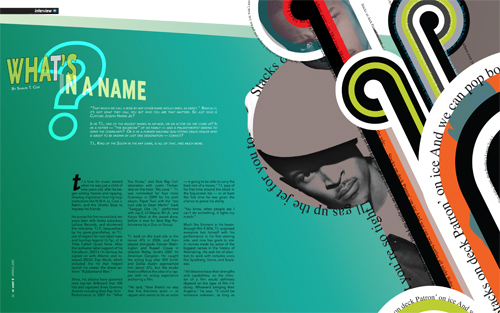 The fold-out spread includes an exclusive interview with T.I. right before being sentenced to prison, Swan Lake revisited ‘Barbie Style’ featuring American Ballet Theatre performers, a fashion photoshoot along the West Side Highway with the cast of West Side Story on Broadway, a look behind Bjork’s “Wanderlust,” a dance comic parody in honor of the Wayan’s brother’s latest movie, Dance Flick, and much more. Movmnt takes performers from the cast of West Side Story on Broadway on a trip down Manhattan’s West Side Highway. Celebrity stylist, Derek Wharburton, from dereklovesshopping.com, colorfully styles the performers with photographer and journalist, Matthew Murphy, behind the lens while Movmnt re-imagines some of the famous images from West Side Story. Movmnt raps with T.I. right before his incarceration to find out how the real Clifford Joseph Harris, Jr. has reinvented himself. Also in this issue, Movmnt pays tribute to U2′s everlasting career, interviews young singer/songwriter Serena Ryder, and investigates the history of Clyde Stubblefield’s famous drum sample. Don’t forget about Movmnt’s favorite playlist and music reviews, as seen in every issue. This spring, Movmnt steps up to the economical challenge without compromising its coverage and stories, even though this issue was printed using less paper. No advertising on the poster means a full 32 pages of content. Not to mention, with the poster you also get full free access to the online version that has exclusive extended content in the form of a flipping magazine. The online version of Movmnt reaches out to new audiences and gives them interactive access at their fingertips. 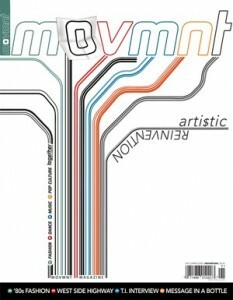 If you would like to purchase either the poster combined with extended content or just the digital version of this special issue, visit movmnt.com/backissues/issue9. Here is some of the exclusive content available online in the full extended digital edition accessible for free to all our subscribers and newsstands readers. The Reality of Broadway: Can Broadway be saved from Reality TV?